This Kindergarten game will support students as they begin decomposing numbers less than 10. First graders may also have success with this game as they begin decomposing and composing numbers. Laminate and cut the task cards into squares. 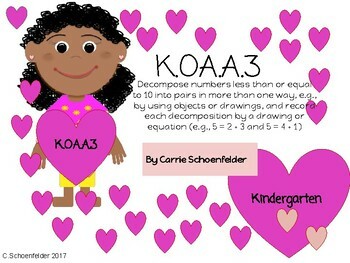 Each card contains a number for students to decompose. The heart at the top of the contains the number that will be broken apart. 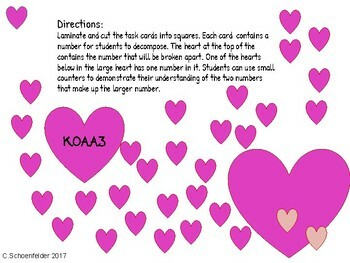 One of the hearts below in the large heart has one number in it. Students can use small counters to demonstrate their understanding of the two numbers that make up the larger number. 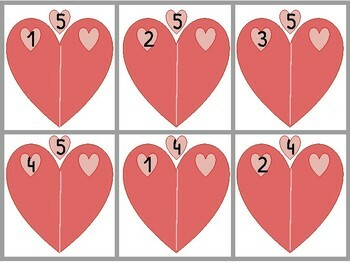 Students can either write the number on the blank heart or on a white board. Manipulatives may also be used to demonstrate numbers on the cards. Pairs of students can compare their numbers. The student with the larger number gets to keep both cards. The student with the most cards wins the game. The possibilities are endless.